Welcomed at Calama airport by your tour guide, you will be taken to your hotel in San Pedro de Atacama by private vehicle. 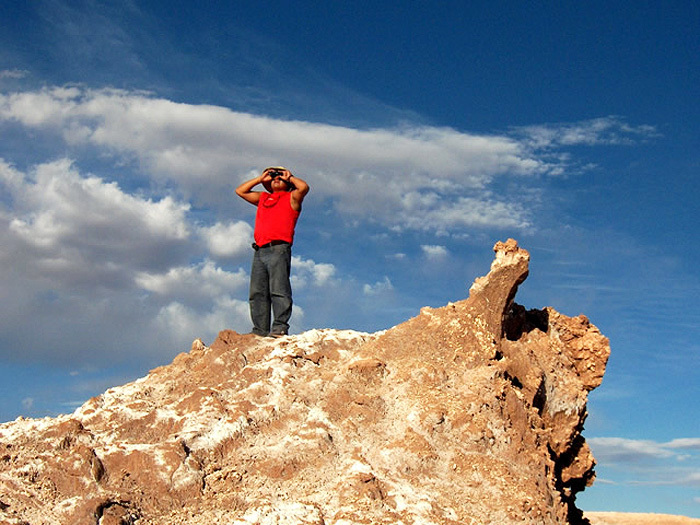 En route, you will be able to get your first glimpse of the Cordillera de la Sal – the Salt Mountain Range. In the afternoon, you will hike through a gorge in the Salt Mountains to reach the Valley of the Moon: a bizarre lunar landscape that is set ablaze with colour during every sunset. Strange rock formations and the Lincancabur volcano provide the backdrop for this unforgettable excursion. The return to San Pedro and your accommodation is after sunset. Level of difficulty: medium (8km/5mi; 4hrs; difference in elevation around 60m/197ft). Distance from San Pedro 15km/9mi. Hike through a deep rock canyon to the Puritama hot springs whrer you arrive after 4-5hrs. Relax in the warm water, in the middle of a unique landscape, before being taken back to San Pedro. In the afternoon, you can visit the Padre Le Paige Museum, with its famous collection of historic finds that illustrate the development of the indigenous Atacama Culture. Also part of the tour is San Pedro’s 17th century church, with its roof made of cactus wood. Overnight in San Pedro. Level of difficulty: medium (14km/9mi; ca. 5hrs; difference in elevation around 300m/984ft). Distance from San Pedro 35km/22mi. Today you will drive high up into the altiplano: the highland plateau. Lonely desert roads will take you past the mountain oasis of Socaire, where the small numbers of inhabitants still live off traditional terraced farming, cultivating corn, wheat and potatoes. Climbing higher, beyond 4000m/13,124ft, you are rewarded with a spectacular view: the blue-black twin lagoons of Meñiques and Miscanti. Framed by white salt deposits, they are majestically peaceful. The animal life in this region is particularly varied, as it includes flamingos, various duck species, and many other birds that can be observed all around the lagoons. In addition, there are lamas and vicuñas, who quietly move along the hillsides in small groups. 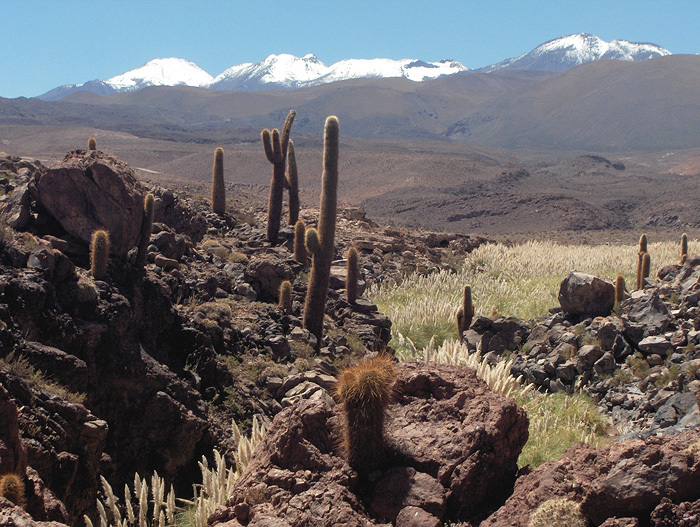 In the background, the Meñiques Mountain towers above all, overlooking the broad plain of the altiplano. 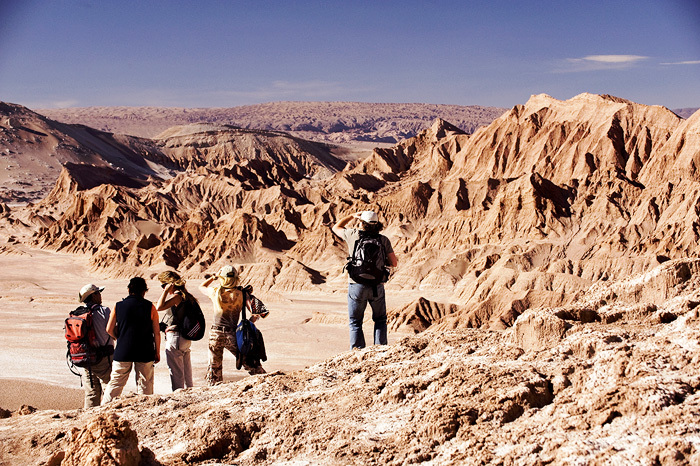 Afterwards, you will be taken to the Salar de Atacama. This 3000 sq km/1,158 sq mi salt lake is rich in minerals, such as borax and lithium, and is also home to various species of flamingo. Laguna Chaxa, which is part of the Reserva Nacional de los Flamencos, offers outstanding opportunities for observing these birds close-up, and in their natural environment. The return drive to San Pedro and your hotel is in the evening. Level of difficulty: medium to hard, due to the altitude (ca. 8km/5mi, around 3hrs, increase in elevation about 150m/492ft); distance from San Pedro 150km/94mi. 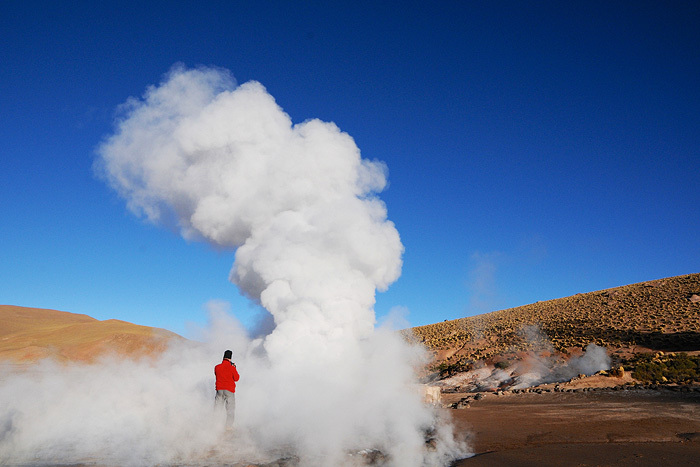 Departing in the very early hours of the morning, accompanied by your tour guide, your first destination is the El Tatio geyser field, located at an elevation of around 4,400m/14,436ft. Dawn presents a spectacular show, when thermal springs bubble and around 40 geysers shoot water high into the air. The early sunrays reflecting rainbow colours in the spumes is undoubtedly an unforgettable sight. This is also where you set off to hike onto the Cerro Zoquete, a volcanic crater that overlooks the geyser field from a height of 900m/2,953ft. It is easy to reach, as long as you are sufficiently acclimatised to the altitude. Afterwards, return drive to San Pedro and your hotel. 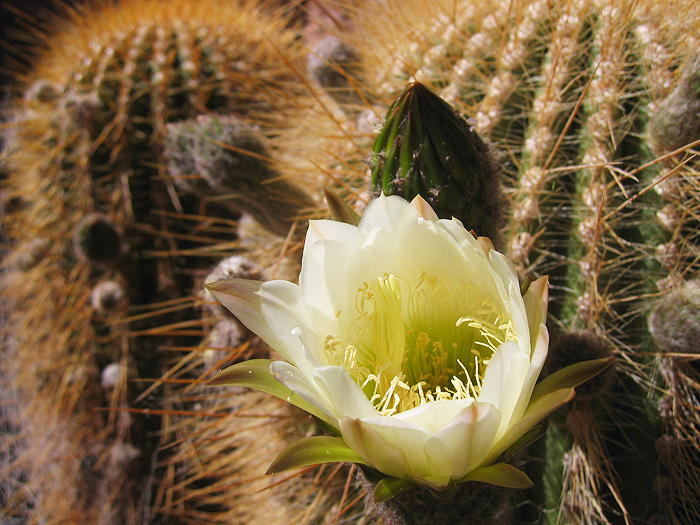 Level of difficulty: medium to challenging, due to the altitude (6km/4mi, ca. 5hrs-6hrs; increase in elevation about 1000m/3,281ft); distance from San Pedro 90km/57mi. Transfer from your hotel in San Pedro to Calama airport. Good trekking boots are recommended for this tour, as well as sunscreen and clothing for warm and cold temperatures.